1866: Eureka! Erasmus Jacobs, a 15-year-old farmer's son, finds Africa's first authenticated diamond near the Orange River, Hopetown. 1869: The Star of South Africa, an 83.5 carat rough diamond, is discovered by a Griqua herdsman in Hopetown. It triggers the first diamond rush. 1870: In mid-1870 diamonds are found in the river diggings at Klip Drift (now Barkly West), triggering the second diamond rush. Later that year diamonds are found at the farm Bultfontein on the edge of modern-day Kimberley. In December diamonds were found in the adjacent Du Toit's Pan, triggering the third diamond rush. Cecil Rhodes, aged 17, arrives in South Africa. He sells ice to miners in the hot African sun and saves his money. 1871: The De Beers Mine is discovered in May, and the Kimberley Mine in July. The latter , initially known as New Rush (then Kimberley Mine, and now the Big Hole), would become the world’s richest mine for nearly a century. 1873: Barney Barnato, 18, joins his brother at the Kimberley digs. Meanwhile, Cecil Rhodes buys a claim. 1874: "Barnato Brothers Dealers in Diamonds and Brokers in Mining Property" opens for business. 1887: Cecil Rhodes and Barney Barnato, each buying claims and shares in nearby mines, vie for commercial pre-eminence at the Kimberley diamond fields. To out produce each other, they flood the market causing diamond prices to plummet. A merger is the only solution..
1888: De Beers Consolidated Mines Limited is established on 12 March. Rhodes is named founding chairman. 1890: The Wesselton Mine is discovered. Ten merchants form the London Diamond Syndicate, and agree to buy De Beers' entire production. 1897: Barney Barnato dies tragically when he falls from the SS Scot en route to England. 1899: Within days of the outbreak of the second Boer War, the town of Kimberley is besieged. It remains under siege, its mines closed, for 124 days. 1902: Cecil Rhodes dies at his cottage at Muizenberg, aged 48. Before his death, he's heard to say, "So little done, too much to do." The same year, Ernest Oppenheimer arrives in Kimberley to work as a diamond buying agent. He and Rhodes never meet. 1914: The outbreak of war causes the suspension of all mining at De Beers’ properties. The Kimberley mine never re-opens. The northern Cape in March 1867 was a hot and desolate place. However, to young Erasmus Stephanus Jacobs, 15, there was much with which to amuse himself as he played with the 'klippies' which abounded on their farm De Kalk near Hopetown (120km south of present day Kimberley). Erasmus was somewhat amused when a neighbour, oom Schalk van Niekerk, asked if he could borrow one of the play stones which he had found a year earlier - a particularly shiny one. Schalk took the stone to a friend, John O'Reilly, who lived at 'Rooikop', some hours away. O'Reilly seldom stayed in one place for long, as he usually travelled about by ox-wagon, trading and hunting, and often shot lions on his trips to the north. Schalk mentioned that he believed the stone to be a diamond on account of its hardness and weight. O'Reilly showed the stone to Jewish storekeepers at Hopetown who ventured that it might be a topaz. At Colesberg he was about to throw it away when the Acting Civil Commissioner, Lorenzo Boyes, suggested trying it on a pane of glass. They then sent it to Dr W.G. Atherstone of Grahamstown in a plain envelope, one of the few people in the Cape Colony who knew anything about minerals and gems, who identified it as a 21.25-carat brownish yellow diamond. . Dr Atherstone in turn passed it to Mr Southey, the Colonial Secretary. Sir Philip Wodehouse, then Governor of the Cape Colony, thereafter bought it for £1,500. Southey stated: 'This diamond is the rock upon which the future success of South Africa will be built'. The diamond was shown at the Paris Exposition in 1867 and later cut to its present form, whence it became know as The Eureka Diamond. This 10.73-carat brilliant is not, by ordinary standards, exceptional. However, it was cut from the first diamond found in South Africa in 1866, and therefore has historical significance. Although Erasmus Jacobs never found another diamond, Schalk van Niekerk was luckier. Three years later, having learned something of precious stones, Schalk traded a shepherd boy for a stone, giving him five hundred sheep, ten oxen and a horse. It was practically all of van Niekerk's possessions, but a few days later in Hopetown he sold the rough crystal to the Lilienfield Brothers in Hopetown for £11,200. 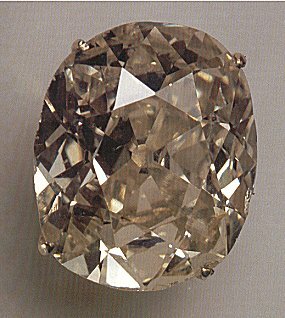 Later, the stone was purchased by Louis Hond, a diamond cutter, and fashioned to what was described as an "oval, three-sided brilliant" and was sold to William Ward, the Earl of Dudley, for £25,000. 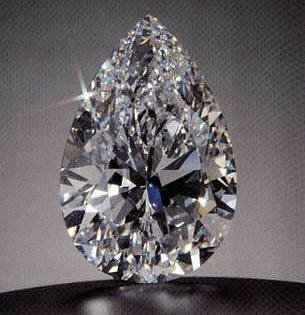 The the Star of South Africa (also known as the Dudley Diamond) stayed in the Wards' possession until 2 May 1974 when it was sold on auction in Geneva for 1.6 million Swiss Francs, equivalent to around £225,300 at the time. The diamond resided in the Natural History Museum in London for a period of time in the early 2000s and was also part of the "Cartier In America" travelling exhibit in 2009 - 2010. These two finds led to the first diamond rush in 1869 to the banks of the Orange River. However, a second far greater find was made in 1870 on the gravel banks of the Vaal River near Barkly West (35km north-west of present day Kimberley). At the height of the rush to these river diggings, diamonds were found in the mud brick walls of the farmhouse of Bultfontein (Hilly fountain) owned by Cornelius du Plooy. The house was dismantled and the site is now the colossal hole in the ground of Bultfontein Mine. Later that year, in December 1870, children found diamonds whilst playing next to Du Toit's Pan on their father's farm Dortsfontein (Dry fountain). A whole army of diggers stampeded to the place, and the site is now the second colossal hole in the ground of Dutoitspan Mine. Dutoitspan Mine, named such because the farm Dorstfontein originally belonged to Abraham Paulus du Toit, who had built a small house next door to the Pan, a basin shaped like a saucepan that holds water. Du Toit sold the farm to a Mr Geyer for £525 on 12 May 1865, and he in turn sold it to Adriaan J. van Wyk for £870 on 6 January 1869. In May 1871 a new discovery was made on the farm Vooruitzicht (Outlook) that was owned by the brothers Diederick and Nicolaas de Beer (the title deeds to the farm were granted to the De Beers brothers in 1860). This was to become the third colossal hole in the ground of De Beers Mine. In July 1871 a servant working for a party of diggers from Colesberg who were digging at the Du Toit's Pan, found three diamonds on a small kopje (hillock) known locally as Colesberg Kopje, just a few hundred meters from the earlier find on the farm Vooruitzicht. Colesberg Kopje soon became an indentation and then a crater as a new rush of diggers decended on what was also known as the De Beers Mine (the earlier diggings on the same farm became known for a while as Old De Beers). The mining camps around the first three mines were named after their respective mines. With the latest discovery, the camp became known as New Rush, for obvious reasons. Over the ensuring months the digger camp of New Rush swallowed up the earlier camp of Old De Beers. With the renaming of New Rush as Kimberley in 1873, the fourth colossal hole in the ground was known as Kimberley Mine. Today it is known simply as The Big Hole. The satellite township (now named after the baTlhaping chief, Kgosi Galeshewe) was established in 1871. British Colonial Commissioners arrived in New Rush on 17 November 1871 to exercise authority over the territory on behalf of the Cape Governor. Digger objections and minor riots led to Governor Barkly's visit to New Rush in September 1872, when he revealed a plan instead to have Griqualand West proclaimed a Crown Colony. Richard Southey would arrive as Lieutenant-Governor of the intended Crown Colony in January 1873. Months passed however without any sign of the proclamation or of the promised new constitution and provision for representative government. The delay was in London where Secretary of State for the Colonies, Lord Kimberley (John Wodehouse, 1st Earl of Kimberley), insisted that before electoral divisions could be defined, the places had to receive "decent and intelligible names. His Lordship declined to be in any way connected with such a vulgarism as New Rush and as for the Dutch name, Vooruitzicht… he could neither spell nor pronounce it." The matter was passed to Southey who gave it to his Colonial Secretary J.B. Currey. A correspondent at the time wrote, "when it came to renaming New Rush, Currey proved himself a worthy diplomat. He made quite sure that Lord Kimberley would be able both to spell and pronounce the name of the main electoral division by, as he says, calling it 'after His Lordship'." New Rush became Kimberley by Proclamation on 5 July 1873. Digger sentiment was expressed in an editorial in the Diamond Field newspaper when it stated "we went to sleep in New Rush and waked up in Kimberley, and so our dream was gone." Kimberley became a municipality in 1877. The digger camp of Du Toit’s Pan also swallowed up the earlier camp of Bultfontein, and was subsequently re-named Beaconsfield after the former British Prime Minister, Lord Beaconsfield (Benjamin Disraeli, Earl of Beaconsfield). By 1882 a tramway connected Kimberley to Beaconsfield and the streets were illuminated by the first electric lights in Southern Africa. In 1888 the great amalgamation took place between Rhodes' De Beers Mine and Barney Barnato's Kimberley Central Mining Company. The Wesselton Mine, close to the Bultfontein and Dutoitspan Mines, started in 1890. It was the fifth and last of the colossal Kimberley mines. Also in 1890 Rhodes rose from being the digger's representative for Barkly West in the Cape Legislature to Prime Minister of the Cape Colony. A little known fact is that the Seventh Day Adventists religious group was founded by Pieter Wessels in 1885 in a small corrugated iron church on the corner of Blacking Street and Dyer Place in present day lower Herlear. It was amply financed to the sum of £451,438, paid in 1891 by the De Beers company in exchange for the Wesselton Mine, a Wessels family property. The two towns of Kimberley and Beaconsfield were eventually amalgamated in 1912 to form the City of Kimberley.